This past week, over 200,000 Israelis visited the Jewish communities in Gaza and northern Samaria that are slated for expulsion. This massive show of support should serve as encouragement to us all - the people of Israel have not forsaken their Land, even if their government has. 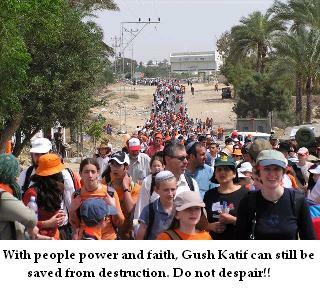 The struggle for Gush Katif and northern Samaria is far from over - and, as I suggest in the article below - if we employ some good ol' fashioned "people power" together with faith, then we can and will prevail. These are difficult times for opponents of Ariel Sharon’s Gaza withdrawal. Politically, Sharon has succeeded in dodging the various obstacles that stood in his path. Diplomatically, his proposal has received the “blessing” of US President George W. Bush and much of the rest of the world. Domestically, the media stands solidly behind him. Israel’s courts are almost certain not to intervene, and local pundits and opinion-makers are backing him enthusiastically. Indeed, at this point it seems there is little standing in the way of Sharon’s plan to expel Gaza’s Jews from their homes. Little, that is, except for faith. Recently, a couple I know decided to move to Gush Katif. Determined to stand in solidarity with the thousands of Jews living under threat of expulsion, they left behind a comfortable villa, friendly neighbors and familiar surroundings, and moved into a tiny caravan, together with their numerous, and rather boisterous, children. The father is a respected physician, and he will continue to treat his patients by commuting to and from his clinic in Jerusalem. The mother has thrown herself into the campaign against withdrawal, speaking out, raising funds and dedicating her time to protecting her family’s new home. Why did you do it? I asked. What prompted you to move? “We couldn’t. We just couldn’t sit back and watch”, he replied. “The pullout would endanger Israel, and we need to show the world that this land is ours”. But what will you do, I said, if soldiers come to remove you from your home. How will you deal with such a situation? How naïve, you might think. What could these people possibly hope to accomplish? The jig is up, the game is over. Perhaps they should just throw up their hands and accept defeat? Sorry, but that is just not the Jewish way. If it was, then Israel would have closed up shop and called it quits a long time ago. All is not lost. This game is far from over. Those who love the land of Israel and cherish it can prevent the retreat from taking place. The first step is to reach out and help those people, like my friend the doctor, who are willing to move to Gush Katif. Over 1,000 Israelis have already done so in the past few months, and many more are reportedly in the process. To meet the demand, long-time activist Datya Yitzhaki launched the “Minhelet Kela”, a Hebrew acronym for the Gaza Absorption Authority, which has been busy refurbishing homes, thereby enabling dozens of families to make the move and help strengthen Gush Katif. There are numerous empty structures of all sorts throughout the area, many of which can easily be converted into living space. Yitzhaki and her colleagues, who can be reached at: eylond@ort.org.il, note that this would enable Gush Katif to absorb thousands of additional residents in the coming months, giving it a big numerical, as well as emotional, boost. The second, and equally critical, step in blocking the withdrawal is to create a “Wall of Faith” around Gush Katif prior to the date of the planned expulsion. If tens of thousands form a passive human chain around the area, one bound together by resolve and faith, they can prevent the demolition from taking place. In effect, it all boils down to simple arithmetic: bring as many people as possible, making it hopelessly impractical to remove them. There are sure to be untold thousands of Israelis who will take part in this undertaking, but I think it is essential to reach out to friends and supporters abroad as well, such as US Christians, and to encourage them to come and take part in protecting Gush Katif. The presence of large numbers of US Christians standing arm in arm with Israeli Jews in defense of G-d’s Holy Land, would send a potent message that is sure to echo through the corridors of power in Jerusalem and Washington. In Hebrew, Gaza is referred to as “Aza”, which means ‘strength’ or ‘might’, perhaps suggesting that only if we muster within ourselves the determination to stand up for what we believe in, can we possibly merit to succeed. Now, more than ever, this is a struggle for the integrity and the future of the Land that was given to Abraham, Isaac and Jacob. Anyone who believes in the Bible, and in G-d’s eternal promise to His people Israel, can not and must not remain silent. The writer served as an aide to former Prime Minister Binyamin Netanyahu.